How to share a PC between several users? Indeed, it's a serious question for those who have a single computer for shared home usage. The problem arises when everyone wants to use a computer at the same time. IBIK company is here to help you share your PC between several users by providing each and every home user with the innovative ASTER program allowing to run one PC for 2 users (and more!) just in a few easy steps and without having to set up terminal stations or thin clients. ASTER shared computer access software allows using computer's capacity to share your PC between several users. You may rest assured, having 2 users on 1 PC unit is a simple, convenient and yet cost-effective way to obtain one more workplace for your home or office needs. While running one PC for 2 users, you have freedom to work on your computer at any time as well as benefit from huge savings on hardware costs. If you are still a little skeptical about using one PC for 2 users (and more), download a free trial version of ASTER software right now. You will easily learn how to share a PC between different family members: just by having two monitors connected and an extra keyboard, mouse and a second video card, it’s possible to fully equip a second workplace at home. Moreover, several users may work with the same applications at the same time, playing games, watching movies and performing other activities simultaneously because our advanced program to share your PC supports the work of 2 users on 1 PC as if each of them had their own computer. 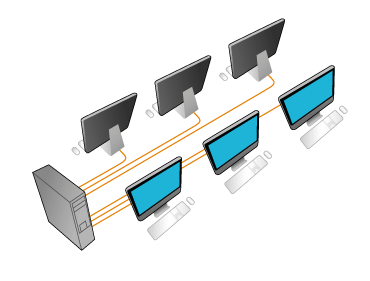 Don't bother yourself how to share a PC system to run several monitors anymore! A new solution for 2 users on 1 PC from IBIK is not limited to just 2 users: you can create up to 10 independent computerized workplaces from a single standard PC. That's why ASTER can be successfully used in offices, computer classrooms at schools, colleges, universities and other establishments while ensuring reliable and stable operation.